Getting a wide stereo sound in mixes or recordings is one of the most desired techniques in music production. And as there are actual ways you can accomplish this using recording techniques like Blumlein or mid-side techniques, we often find that we need to apply stereo widening to already recorded tracks within our DAW. One of the best ways to do this is with a dedicated software plugin. Quite likely, your DAW may have something within the lines of a stereo widener, and there are many good quality paid versions out there. 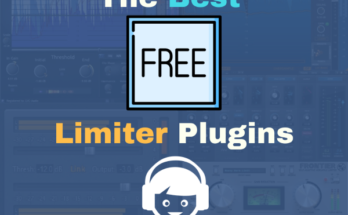 But we decided to take a look at some of the best free stereo widener VST and AU plugins available for download in this guide. Let’s check ’em out! Here we go over some of the most effective free stereo widening plug-instructor available, all of which can do a great job of making individual tracks bigger and wider. With simplified control and undeniably great sound, these free plug-ins are excellent alternatives to costly and impractical hardware solutions and esoteric studio techniques. 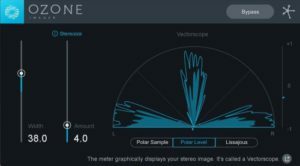 iZotope’s Ozone Imager is the free standalone plug-in version of the imaging technology found in the company’s own Ozone mastering suite. Although it has a much simpler set of controls than its more fully-featured counterpart, Ozone Imager is nevertheless capable of narrowing or widening the stereo image of your audio to a remarkably precise degree. Like most of the components of Ozone, Imager provides immediate visual feedback that enables intuitive setting of the parameters. The plug-in even has a vectorscope and a correlation meter that aid in precision sound-staging during mixing and mastering. Voxengo’s Stereo Touch employs mid/side coding in transforming the most basic mono sources into rich stereophonic tracks. 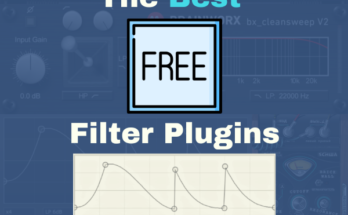 Best suited to mono sources that don’t have a lot of sharp transients, it is especially effective for widening acoustic and electric guitars, synthesizer pads, and vocals. With the spacious and expansive “surround” produced by this plug-in, you no longer have to devote time and channel space to double tracking. Stereo Touch also works on multi-channel input signals, processing each one independently as separate mono signals. The stereo streams are then combined to produce a single stereo signal at the output. Whether you are looking for a quick way to add stereo imaging or you want to widen a mono source, Stereo Touch will deliver like a champ. A1Audio’s A1StereoControl does exactly what it says on the tin: give you precise control over stereo imaging. Even though it is equipped only with a single knob, you can expand or limit your tracks’ stereo width to a remarkable degree. One of the best things about A1StereoControl is how easily it helps you sidestep a common issue when “stereoizing” bass sounds. The plug-in has a “Safe Bass” algorithm that centers all the low frequencies below a user definable threshold. This keeps bass and other low-end sounds right at the center of the stereo spread, where they won’t cause any phasing issues. Even without the dedicated mid/side controls found in other imaging plug-ins, A1StereoControl prevents your low end from causing any issues when collapsed to mono. 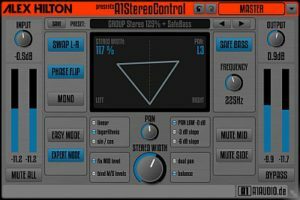 MeldaProduction’s MAutopan is more of a panning plug-in than a dedicated stereo imager, but it is quite a capable one at that. 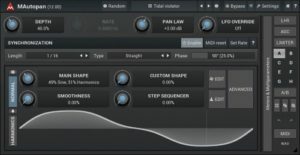 The plug-in employs a unique modulation system that consists of continuously adjustable oscillators. Each of these oscillators may combine predefined shapes, custom waveforms, and algorithmic post-processing. The result is a tremendous degree of control by which you can define the stereo placement of your sounds. MAutopan actually handles more than just mono and stereo sources. The plug-in is also capable of processing up to eight channels of surround audio, making it a useful tool for game and film audio production. 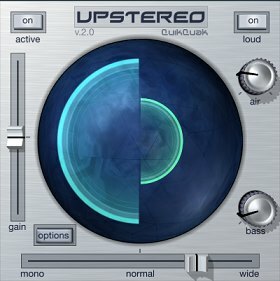 QuickQuak Audio’s UpStereo is a sort of classic in stereo imaging circles, with a set of simple controls that can make short work of stereoizing any mono source. It employs a fixed frequency EQ, a stereo widening unit, and a loud switch, all of which result in bigger, wider, and louder tracks. Unlike most other stereo widening plug-ins, UpStereo comes with an option to push the sound into overdrive. Combined with the stereo widening capabilities of the unit, this makes it possible to produce individual sounds that stand out without the need for extensive processing. Brainworx’s bx_solo is a free stereo imaging plug-in offered for free to everyone who signs up at Plugin Alliance. Employing the infinitely useful m/s processing technique, it gives you a surprising degree of control over the placement of sounds in the stereo spread. A comprehensive range of solo features are included with the bx_solo, giving you the ability to hear the left, right, middle, and side channels while tweaking. This feature alone adds a lot of functionality to any DAW, very few of which allow for such flexibility. 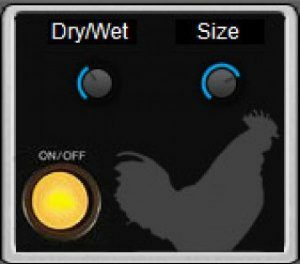 Xfer Records’ Dimension Expander is a spatial expander modeled after the popular Boss/Roland Dimension D chorus effect. By splitting audio into four parts, flipping the phase of two streams and then delaying them, the plug-in produces rich, lush, and wide textures that retains punch and clarity. Admittedly, the Dimension Expander is a bit of a one-trick pony. But the trick is a pretty damn impressive one. And considering the relative rarity and cost of the Dimension D in the vintage market, this free plug-in will make a welcome addition to your suite of stereo imaging plug-ins. The Ozone Imager is pretty much the one to beat in this roundup. Offering all the flexibility, control, and great sound that iZotope has become known for, it can handle most every stereo widening need you can think of and then some. That being said, the Voxengo Stereo Touch, the A1StereoControl, and MAutopan all deserve special mention as well. Going well beyond the capabilities offered by most stereo imaging plug-ins, and or all of these three will find a welcome place in any mix engineer’s arsenal.